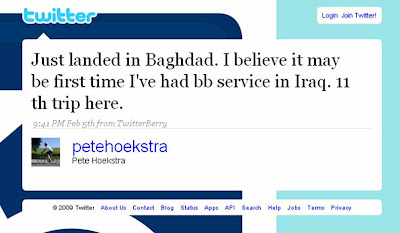 Pete Hoekstra, Michigan Congressman and House Intelligence Committee member, has just got back from a trip to Iraq. 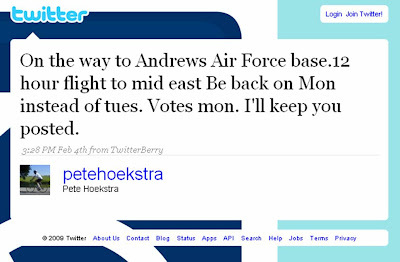 According to Congressional Quarterly (CQ Politics) for security reasons this trip was supposed to be secret, but Mr.Hoekstra has been Twittering throughout! Whilst I am in favour of open government and transparency of government actions, I am not sure that the above is a good idea. Do government officials need guidelines as to when social media usage is and isn't advisable? 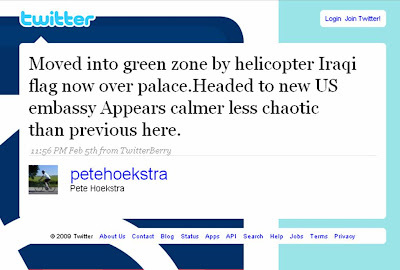 I may be going mad, but didn't Peter Hoekstra used to play for Stoke? What was the risk of posting what he did -this utter paranoia that people with IED's are going to be looking at their blackberry's first to look up another congessman. I think instead, secrecy is in military DNA, and that fear will be used to prevent open access that doesn't need to be protected, yet. Unrelated, but could you please get in touch with me -sent an email a week ago.